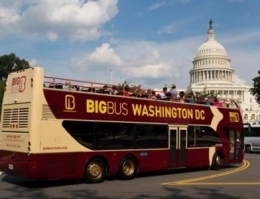 [BigBus Tours] The government shutdown prevented Big Bus Tours and other companies from taking visitors close to monuments in the nation’s capital. Officials from Destination D.C. say they won’t know the full economic impact of the shutdown until next summer. But D.C. Mayor Vincent Gray said at recent news conference that the government shutdown probably cost the city about 8 percent in lost business revenue, mostly from tourism and hospitality industries. A record 18.9 million tourists visited the District of Columbia in 2012, up 5.5 percent from the previous year, according to Destination D.C. The substantial increase expected for 2013 could now drastically change. Some of D.C.’s most popular tourist companies that serve the National Mall and Capitol Hill areas were among those hit hardest by the closed government offices, blocked federal monuments and slowdown in tourist traffic. Some smaller tourist-dependent closed during the shutdown. Others scaled back on their services. The tourism industry tried to lead visitors to nongovernmental attractions during the shutdown, said Kate Gibbs, media relations manager of Destination D.C., the city’s official tourist website. Big Bus Tours, one of the city’s leading tour guide companies, normally allows customers to explore the city at their own pace. The company is a fan favorite because it allows riders to hop on and off the bus whenever they please, all while enjoying live informative commentary about landmarks such as the Lincoln Memorial, Washington Monument and National History Museum. During the shutdown, Big Bus was not able to drive around the Tidal Basin where most of these landmarks are located, which greatly affected the total number of tours. Maria Vivae, 22, has been working as a receptionist at Big Bus for almost two years and said she has never seen such a dramatic decrease in sales. Grayline, one of Washington’s, premiere sightseeing tours, also endured setbacks due to the limited access to the memorials. Not only did Grayline completely stop providing tours around the National Mall and Capitol Hill, but it also dropped the number of daily tours from at least five to only one or two. Management even tried offering a new tour attraction — the National Cathedral in upper Northwest Washington — but no one signed up. An employee who has worked for Grayline for a few years said during the shutdown she spent most of her workday assisting customers with refunds. “Once customers realized they no longer could enter any of the monuments or museums, they quickly started calling about getting their money refunded from tours they already purchased in advance,” she said. While the tour bus companies struggled during the shutdown, Bike and Roll tours did better than normal. One tour guide, who would identify himself only as Valentine, has been with Bike and Roll for almost four years. He said he was busier during the shutdown than any other time with the company. Valentine said the number of people who registered for bicycle tours doubled during the shutdown. “A lot of people were out of work allowing them more free time to sightsee and take leisurely time to themselves,” Valentine said. Tourists who ride bikes have a better chance at getting closer to the monuments and memorials than those who decide to ride the bus. Although some routes were blocked off for tour buses, bikes were still able to take those routes that lead them closer to the front of the monuments. D.C. Ducks, a vehicle that allows tourists to view the city on land and water, also terminated its tour around the Tidal Basin. To generate more sales, the company tried decreasing prices and offering one free tour for every tour a customer purchased, but the number of riders was still low. Eboni, 26, who has worked with D.C. Ducks for three years, said she fears that the government shutdown will have a lasting effect on tour companies. Alex McRay wrote this article for the Howard University News Service, a 101 content partner.